Sunday's New York Times Week in Review section has a cutesy piece headlined Brooklyn, Meet Your Oligarch, by Moscow correspondent and former Brooklynite Clifford J. Levy, who really has done much better work. The irony is that, had Levy understood the Atlantic Yards project better, he would've mentioned a curious commonality Prokhorov's country and the Atlantic Yards project: AY has been shepherded and approved by the Empire State Development Corporation (ESDC), which has an unelected and hardly well-informed board. No local official has a vote. And the biggest critic of public authorities like the ESDC, Assemblyman Richard Brodsky, calls them "Soviet-style bureaucracies." And I've suggested some of the ESDC's explanations represent "Soviet-style math." MOSCOW — Let’s agree that Mikhail D. Prokhorov, the Russian billionaire who is the latest savior for the Nets basketball team and its ballyhooed move to Brooklyn, is no pushover. After all, oligarchs have their share of occupational hazards: heavily armed rivals, stupendously corrupt bureaucrats and, no doubt, the evil eye of the Kremlin itself. 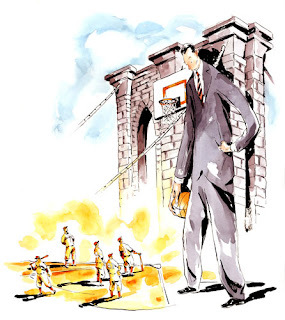 Even so, has Mr. Prokhorov ever faced a foe as resourceful, tenacious and just plain ornery as Develop Don’t Destroy Brooklyn, the grassroots group that has fought the plan for a new arena for the Nets in the borough every step of the way? It's not just DDDB--though it's notable that Levy has a very different view of the AY opposition than does the Daily News. It's an online world in which blogs like this one, NoLandGrab, and Noticing New York can offer reportage, analysis, and critique. The NYT wrote about that phenomenon in April 2006. But Prokhorov has an ally Levy wasn't about to mention. The New York Times Company, parent of his own newspaper, was enmeshed in a partnership with Forest City Ratner to build the Times Tower, and the Times has never ever editorialized against the project. Perhaps Mr. Prokhorov needs an introduction to this place that he hopes will burnish his worldwide reputation (but may instead bring him to tears). And Brooklynites might want learn a little more about the Russian elite, given that Mr. Prokhorov could be as outsize a celebrity owner as George Steinbrenner. Allow me to act as an anthropological interpreter. I live in Moscow, not far from Mr. Prokhorov’s office on Tverskoy Boulevard, though my home until three years ago was in Brooklyn, not far from site of the proposed Nets arena, Atlantic Yards. Yes, there are contrasts. Mr. Prokhorov bankrolled a magazine for Russia’s nouveau riche called Snob. Denizens of Brownstone Brooklyn like to pad around in plastic clogs. Yet first, we should highlight what can unite the two sides. Both mourn former glory, albeit in not quite the same context. Brooklyn once had its own major league sports team, the Dodgers, who played baseball at Ebbets Field before fleeing for Los Angeles in 1958, leaving the borough bereft. Well before baseball, the borough had a storied past, land of Walt Whitman and other luminaries. The Nets arena is supposed to accentuate its renaissance. Why do Times reporters like Levy and Charles Bagli/Richard Sandomir (authors of a 1/16/04 article that claimed a move by the Nets would "repudiate a 50-year cycle of declne") believe the cliche about the loss of the Dodgers? As authors Michael D'Antonio and Pete Hamill have pointed out, nostalgia for the Dodgers began to dissipate in the early 1960s. Russia fell on hard times after the Soviet collapse, and yearns to return to superpower status. The oligarchs, who before the financial crisis were increasingly going international, are considered an engine for restoring the country’s might and prestige. If Mr. Prokhorov succeeds, it would be a boon for both Russia and Brooklyn. Of course, let’s not forget who has helped to drive Brooklyn’s revival in recent decades. Russians! The borough has more than 150,000 immigrants from the former Soviet Union, who began arriving en masse in the 1970s and who have made the Brighton Beach neighborhood, a k a Little Odessa, famous in Russia. OK, maybe this piece is a little tongue in cheek. Surely immigrants helped drive Brooklyn's revival, as did brownstoners, but there are a lot more Caribbeans, for example, than Russians. Still, Mr. Prokhorov, who is to control the Nets and a large minority stake in the arena, may have culture shock when he grasps what it takes to complete a project in New York City. Environmental impact statements? Community board input? Appellate court review? Can’t we get the thumb’s up from the local chieftain and get it done? The reporter in Moscow hasn't done his homework. Doesn't he realize there's no community board input for the Atlantic Yards project, given that Mayor Mike Bloomberg--an oligarch in his own way--passed the project on to the state to override zoning and pursue eminent domain? Or that the environmental impact statement and General Project Plan are written by a consultant, AKRF, that always writes pro-developer documents? And that the project has passed all its bureaucratic hurdles? In other words, Mr. Prokhorov should realize that when it comes to cracking the whip, Marty Markowitz, the bubbly Brooklyn borough president, is no Vladimir Putin. Um, that's because Markowitz has no power. Bloomberg, however, is able to insert new funding for the project in the city's budget and have his appointees on the board of the Metropolitan Transportation Authority offer sketchy justification for revising the deal with Forest City Ratner for the Vanderbilt Yard. Artur Markaryan, head of Russia’s developer trade group, said the arena situation might perplex Mr. Prokhorov because such a backlash over sports almost never occurs in Russia. In fact, Mr. Prokhorov was criticized by some Russian commentators last week for not spending his money on sports teams and arenas in Russia. “Stadiums, and facilities like that, are always very welcomed,” Mr. Markaryan said. Russian oligarchs prefer London, and when they come to New York, they hobnob across the river in Manhattan. Here, then, are a few things for Mr. Prokhorov to know about the species inhabiting the neighborhoods near the arena site, especially the ones that have been noisiest in opposition. The people like organic food and bicycles. They compost. They fuss over their children. They don’t miss living in Manhattan. You get the idea. Muscovites don’t recycle, smoke heavily, are enamored of big cars and often park them anywhere, including all over the sidewalks. They also fuss over their children, maybe more so. But I have never seen them wear plastic clogs. By the way, Brooklyn, with its striking diversity and population of 2.5 million people, encompasses a whole lot more than brownstoners and Russian immigrants (who may be simply the ones who draw more of Mr. Prokhorov’s attention). Mr. Prokhorov, 44, contributed to the bawdy image of the oligarchs when he was questioned, but not charged, in a prostitution inquiry in 2007 in France. Other aspects of his life are more appealing. Earlier this year, he moved his official residence to a village in Siberia, apparently so that he could support the locals by paying taxes there. He is very tall, and enjoys playing basketball, but also has taken up volleyball and kickboxing. But maybe none of this is so important, beyond Mr. Prokhorov’s most noteworthy characteristic. He is very, very rich, and for Nets fans, who have had longstanding disappointments, that counts. My close friend David Goldberg, a Park Slope resident who roots fiercely for the team, said he has already had visions of Mr. Prokhorov using his fortune to lure a certain superstar to the Nets. “As long as he knows how to write ‘LeBron James’ on a paycheck — in Cyrillic or whatever — we are willing to put up with almost anything else,” he said. I'm not sure one friend of the author can speak for the borough. Why can't the Times take AY seriously?